The UK is in the grip of its worst flu season for seven years, figures show. All parts of the UK have seen rises in suspected flu cases since the turn of the year with Wales seeing the sharpest - close to a fourfold increase in GP visits to 64.9 cases per 100,000. The last time there was more flu circulating than this was in 2010-11 when swine flu, responsible for the pandemic of the year before, came back. Hospitals are also seeing "very high" rates of admissions, officials said. However, it appears the strain known as Aussie flu is not causing the most serious illnesses, according to the weekly report up to last Sunday from Public Health England. Instead - of the four strains circulating - a B strain, which does not normally cause high rates of severe illness, is responsible for about half the hospital cases. 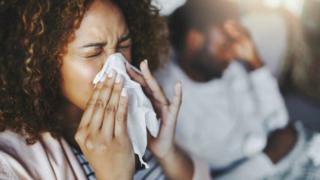 Prof Paul Cosford, of PHE, said while there was a lot of flu circulating it was "not an epidemic" - and there were signs the flu season may be beginning to peak as the rate of increase was slowing down. He also said that death rates seemed to be lower than they were in two of the last three winters. Symptoms include a fever - temperature above 38C - aches, headache, tiredness, a chesty cough, tummy pain and loss of appetite. Having the vaccine, if you are eligible, is the best protection, health officials say. Despite the the rising levels of flu the NHS has begun to get on top of the pressures being seen in A&E units, NHS England said. A spokesman said pressures seemed to be "abating" and hospitals were "generally coping". It comes after the weekly data showed falls in the number of ambulances delayed waiting outside A&E and bed closures caused by the vomiting bug norovirus. Nonetheless, hospitals remain incredibly busy with bed occupancy levels well above safe levels in most of the country. Saffron Cordery, of NHS Providers, which represents hospitals bosses, said: "We're still working at or beyond full stretch, resulting - at times - in care for patients that falls short of what trusts and their staff want to provide." And officials warned the cold snap expected to hit the north of England over the next few days could lead to an increase in illnesses. The North East, North West and Yorkshire and Humber have been put on the second highest level of alert with icy conditions and heavy snow forecast up to Sunday.